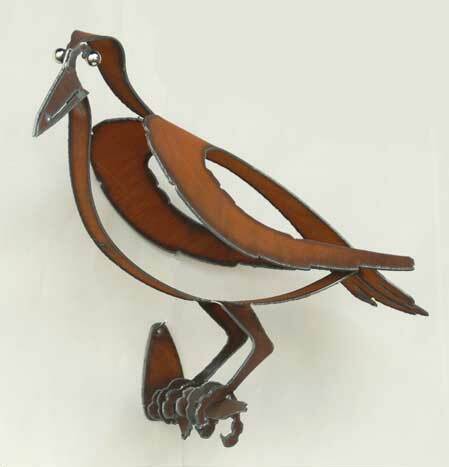 Quizzical Crow Garden Sculpture is NEW to the Dupere collection! Crow trivia...the average American Crow is about 17" to 21" in length. When fully grown the crow weighs about 1lb. By some, the crow is considered to be one of the most intelligent of all birds & has been revered & worshiped over the centuries. The crow is very social in nature. Crows will eat just about anything & never forget where they placed their cache of food for later consumption! Crows are found all over the world except for New Zealand Antarctica, & South America. The crow, as most of us know, is a very vocal bird with a complex system of loud, harsh caws! A full-time artist living in Arizona, Henry Dupere is a skilled & passionat metal sculptor. 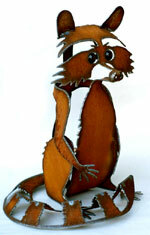 His imagination, sense of humor, & love of nature are expressed in his unique rusted metal sculptures! All of the garden art sculptures in the Dupere collection can be used to add a touch of distinction to any garden or home decor. Size: 11 1/2" tall x 6" wide x 15 1/2" long.